You know those $140 Philips wake up light alarm clocks that everyone is going crazy over these days? Well guess what: they actually work really, really well. Sunrise alarm clocks wake you up gently and leave you feeling far more energized throughout the day. Of course, just because that popular Philips model is worth the money doesn’t mean you should actually spend that much. 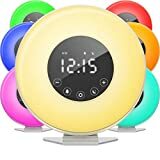 There are plenty of other fish in the sea and the hOmeLabs Sunrise Alarm Clock is a great option that costs much, much less money.